Last month we talked about city and trekking bikes, and this time we’re going to talk about road or racing bikes and mainly about mountain bikes. If you are going to cycle on asphalt roads, there’s no discussion: you need a road bike, lightweight, with big thin wheels and a good number of gears. Now they are built with the lightest aluminium alloys or carbon fibre, with unbelievable total weights. For example, the top-of-the-line Ghost model stops the weight at… 6.5 kgs!, with a carbon frame and Shimano Dura-Ace 20-gear transmission. These bicycles are expensive, with the most basic models starting around 600 euros, and the expensive ones could go above 6000 euros. But more popular and accessible (in price) are the mountain bikes. It was the most recent type of bicycle to appear in the market, because the first mass production models came out in the eighties. It was both the most developed of all the bicycle types and the one with the most advanced design. Now it’s almost impossible to find one without a front fork suspension. Basically, we’ve got two types of mountain bikes, hardtail or ‘fully’ ( Full suspension ). The hardtail models are equipped with just the front fork suspension. They’re the lightest and the best type when you’re thinking of cycling in flat terrain or when you have to climb a lot in the mountains. The basic models don’t have regulation or blockage of the front fork suspension, something really important because if you try to climb any terrain with no blockage in the front fork, the greatest part of your effort will be wasted. Something similar will happen in flat terrain with a good surface, where it is really important to block the front fork if you want to speed up your cycling. The ‘fully’ models came with front and rear suspension. Here the blockage is even more important, because if you have full suspension and you cannot block both suspensions, the experience will be really crap if you want to cycle properly in a flat or hilly terrain. Full suspension bikes are mainly for going downhill. 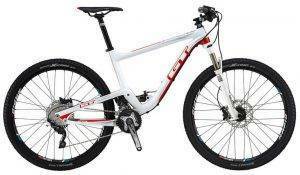 In flat terrain, just when the surface is very rocky or bumpy, the comfort will be better in comparison with a hardtail. The hardtail is always better for climbing up, because, even if you can properly block the rear shock, the lightweight hardtail has the advantage. These are the differences in the two types of mountain bikes. Now, let’s talk about the common components. The usual wheel measure is 26 inches, and the tyres are thick, usually from 1.95 to 2.50 inches, and the rims has to be strong enough to cycle in bad terrain (good ones came with double wall rims). More specifications: at least 18 gears, and typically coming with 21,24 or 27 gears, strong aluminium frame (sometimes carbon fibre in top-of-the-line models), flat or double height handlebars and good braking system, the conventional (since the late ‘90s) V-brake or now, disc brakes. As you can see, the development of these bikes has been really fast in comparison with other types of bikes. For example, disc brakes were introduced in the mountain bikes first, circa 1992, and are now a must in the mid-high end models. You can get a mountain bike for around 200 euros, and you can spend up to 5000 euros in a state-of-the-art model if you want. You can find the right bike in Orange Bikes, come visit us and let’s talk about which bike you need!